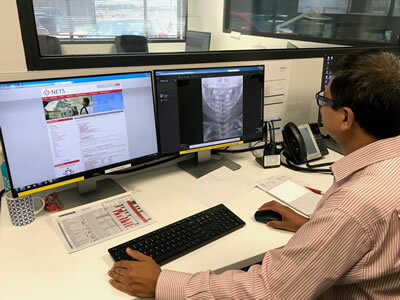 NSW Health clinicians can now access diagnostic-quality medical images from across the state thanks to a major, eHealth NSW-led upgrade of the Enterprise Imaging Repository (EIR) viewer software. Welcoming the state-wide upgrade as a significant advance in the digital transformation of the state’s public health system, radiologists and treating clinicians can access a much improved quality of medical images in the EIR via the electronic medical record (eMR) and the HealtheNet Clinical Portal. The new and improved EIR viewer went live at The Children’s Hospital at Westmead and at NETS (the Newborn & paediatric Emergency Transport Service) in early February, followed the week after by hospitals in Southern NSW and mid North Coast Local Health Districts. At NETS, which is historically one of the highest users of the EIR, the benefits of the new solution to the diagnosis and treatment of the state’s critically ill and injured babies and children were immediately evident to the team. Hosted by the Sydney Children's Hospitals Network, NETS is a state-wide service of NSW Health and the global leader in retrieval medicine for newborns and children; providing expert clinical advice, clinical co-ordination, emergency treatment and stabilisation and inter-hospital transport for the newly born up to children aged to 15 years. “The low-resolution quality of images held within the previous version of the EIR was problematic for NETS and meant that consultants were unable to rely on the content for diagnostic purposes,” said Dr Andrew Berry, State Director of NETS, who assisted eHealth NSW in piloting the new EIR software. “The introduction of DICOM-quality images is a massive leap forward for the EIR. The upgraded interface is more aesthetically pleasing in terms of its design and the clearer fields provide an intuitive user experience for NETS consultants. The theme layout offers a simplified navigation and overall the solution looks more professional. The new EIR viewer is browser-based, meaning it runs on any modern PC without the need for additional software. There are optional mobile apps for approved Apple and Android devices connected to NSW Health’s secure Wi-Fi service. The EIR is the centralised imaging store for NSW Health, and its viewer enables centralised images and reports to be assessed from any modern PC within NSW public hospitals, NSW Ambulance and Justice Health. Since 2012 it has provided clinical staff with immediate access to a patient’s previous and current images, scans and reports, irrespective of which public hospital the patient has visited. “The upgrade is providing higher and now diagnostic-quality of imaging, bringing enhanced patient care and significant cost savings related to fewer transfers and repeat tests being required,” said Kendall Hockey, eHealth NSW’s Group Manager, Clinical Repository and Integration Services.